Headmaster Hoxton writes letter to the parents and students announcing the integration of EHS. EHSHistoryProject cannot be copied and/or distributed without the express permission of Episcopal High School of Alexandria, Virginia. 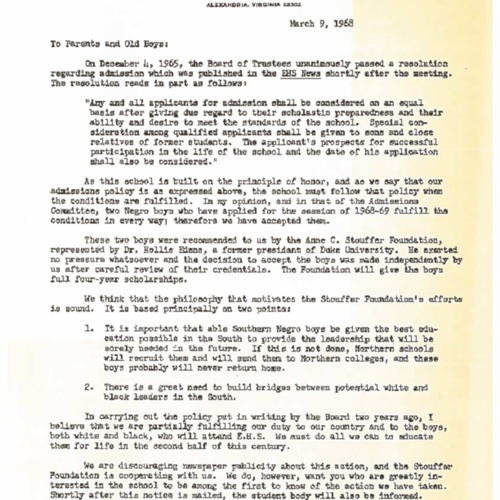 Hoxton Jr., Archibald Robinson '35 (1967-1981), “1968 letter to parents announcing integration at EHS,” EHS History Project, accessed April 22, 2019, http://ehshistoryproject.org/items/show/68.